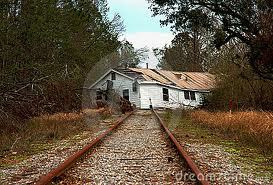 Once upon a time there was a man named Mike McMorris, who lived on the railroad tracks. Every morning when he left for work at the Smithboro factory for reflective dog collars, Mike would worry and wonder if his little house was in trouble. Sure enough, every evening at seven o’clock, when he got home, his little house was knocked down. Every night before he went to sleep in-between the railroad ties, Mike McMorris would re-build his house, back up to specific and exacting measurements. This entry was posted in WordPosts. Bookmark the permalink. We laugh – but we cry because we can identify. Sometimes our choices are just as ridiculous. What an amazing God we have, that He continues to work in us! Wonderful reblog showing us how ridiculous our daily choices are sometimes. Going out “by a different way”, as the WiseMen did from that Bethlehem stable to stay away from Herod, is what we often think of last, instead of first, as a good choice!